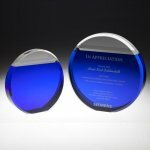 This elegant cathedral arched acrylic award boasts a large area for personalization that is highlighted by a rich blue soaring double wave design at the bottom. The beveled edges and clear accents in the blue wave design reflect light for added visual appeal. Available in two sizes, the award is 1 inch thick and freestanding. It's a perfectly stunning recognition of excellence or milestones achieved. This elegant rectangle acrylic award boasts a large area for personalization that is highlighted by a rich blue soaring double wave design at the bottom. The beveled edges and clear accents in the blue wave design reflect light for added visual appeal. Available in two sizes, the award is 1 inch thick and freestanding. It's a perfectly stunning recognition of excellence or milestones achieved.